CARVER COMPANIES: It operates several industrial facilities, including the Port of Coeymans on the Hudson River in upstate New York. Port Manatee site has 1,400-foot-long conveyor system, truck loading facilities, and deep-water access. Site falls in line with Carver’s core capabilities of aggregate supply, heavy construction, and maritime operations. Port Manatee site provides foundation for Carver to serve its customer base in Manatee County. Port Manatee and Carver Maritime LLC have entered a long-term marine terminal operating agreement for a 10-acre aggregate offloading facility at the Florida Gulf Coast port. The agreement, for as many as 20 years including options, was approved earlier in August by the Manatee County Port Authority and ensures property lease payments totaling $1.8 million for the initial five-year term, in addition to wharfage payments for annual cargo throughputs. The Port Manatee facility will be the third maritime endeavor for Carver Companies, which was founded in 1989. 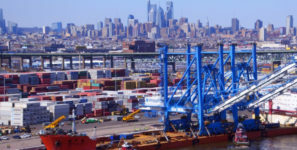 The first, the Port of Coeymans, a 400-acre privately owned and operated maritime industrial complex, opened in 2007 on the Hudson River, 10 miles south of Albany, New York. The second was established in 2016 on a former naval base property in North Charleston, South Carolina, and now encompasses 40 acres of industrial laydown and warehousing. “Carver provides a perfect addition to the diverse family of operations at Port Manatee,” said Carlos Buqueras, Port Manatee’s executive director, who noted that it joins Kinder Morgan, Federal Marine Terminals, Logistec and Logistec Gulf Coast among the ranks of Port Manatee marine terminal operators and stevedores.